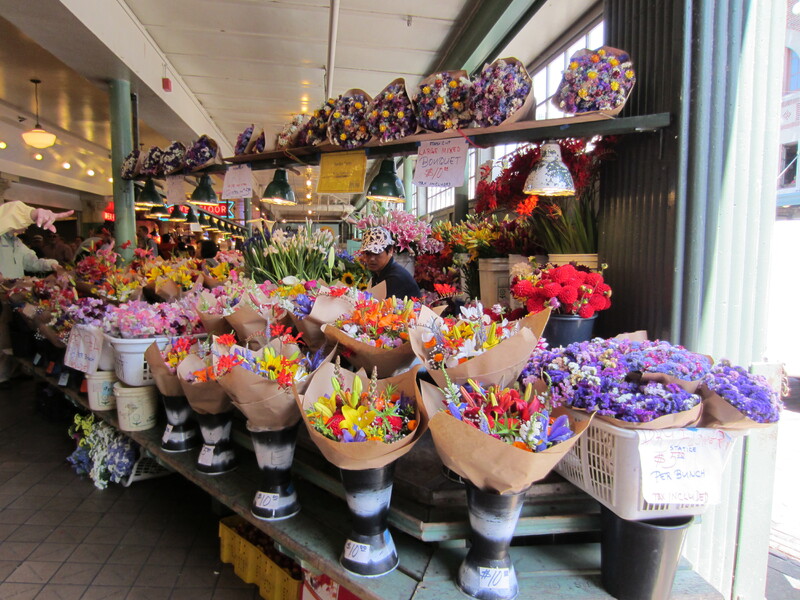 No trip to Seattle is complete without a visit (or two) to Pike Place Market. 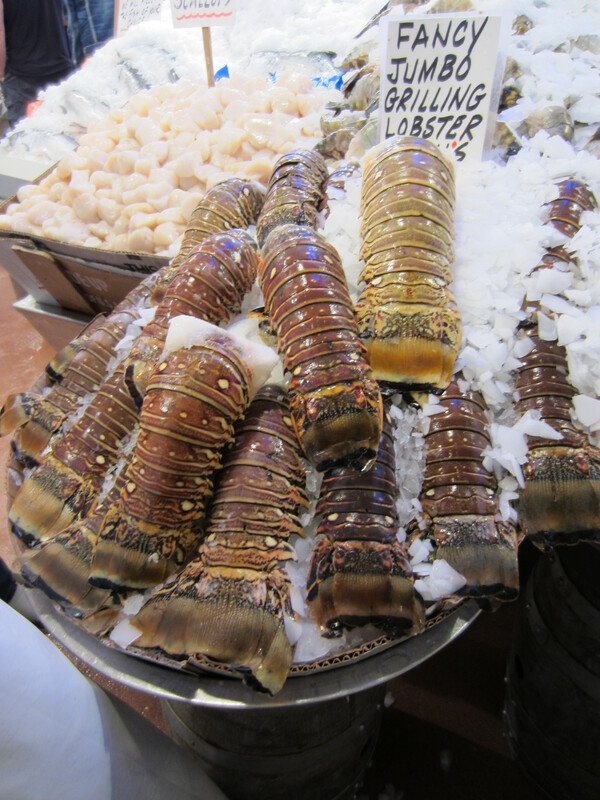 There are tons of flowers, fresh seafood, fruit, vegetables, and vendors selling jewelry, scarves, T-shirts, and other items you just can’t live without. 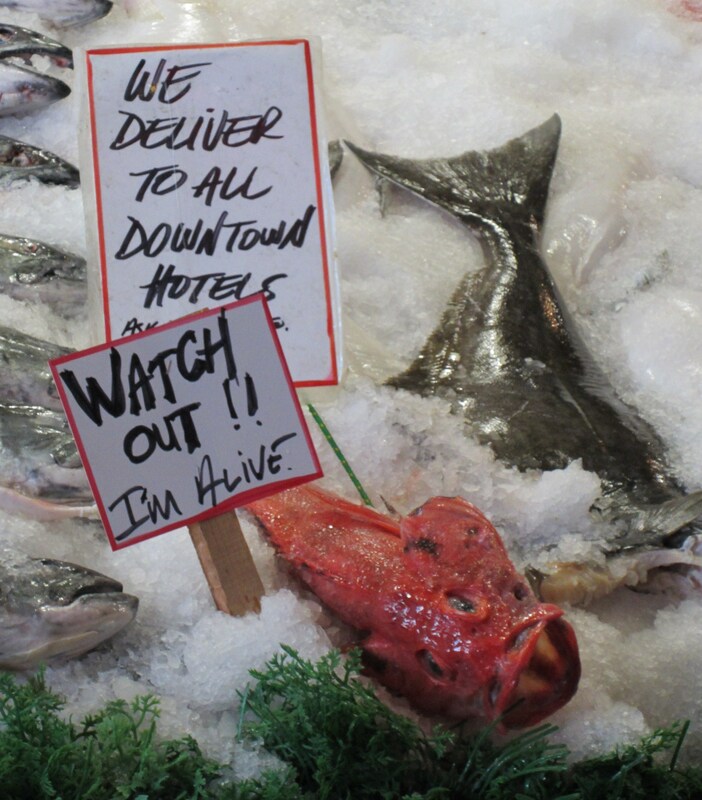 Catch a fish in mid-air at the Pike Place Fish Market (literally) and check out the creepy looking creatures on ice. This guy was actually moving! There are plenty of food options at the market but the #1 breakfast is undoubtedly the Soundview Cafe. I had the best egg sandwich I have ever tasted. The egg was done to perfection and the ciabatta bread was light and fluffy. Order at the counter and the wait staff will bring your food — hopefully you’ll be able to get a table by a window. 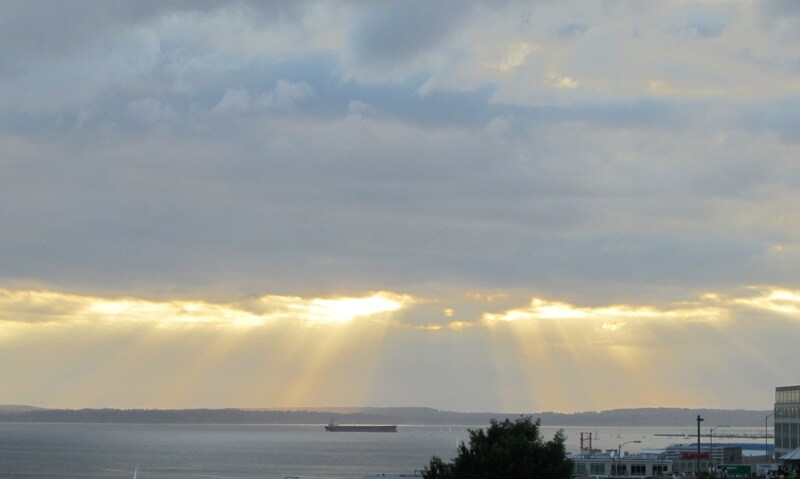 Enjoy the food and the beautiful view of Puget Sound. The next time, I must try the pancakes. For lunch the salad bar looked delicious. Seattle is a great coffee city. 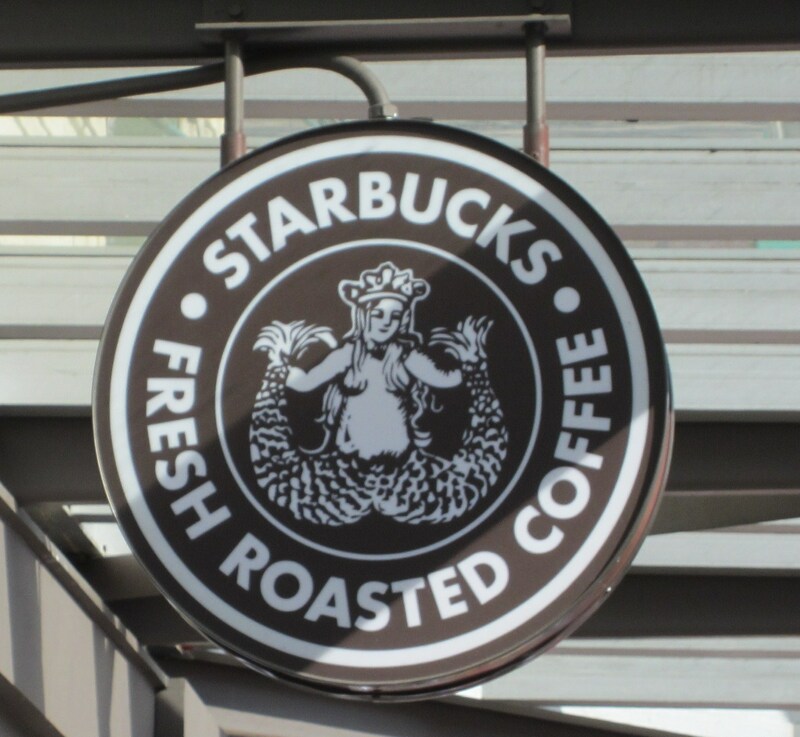 So for the coffee-lovers – you must check out the first Starbucks that still displays the original logo. 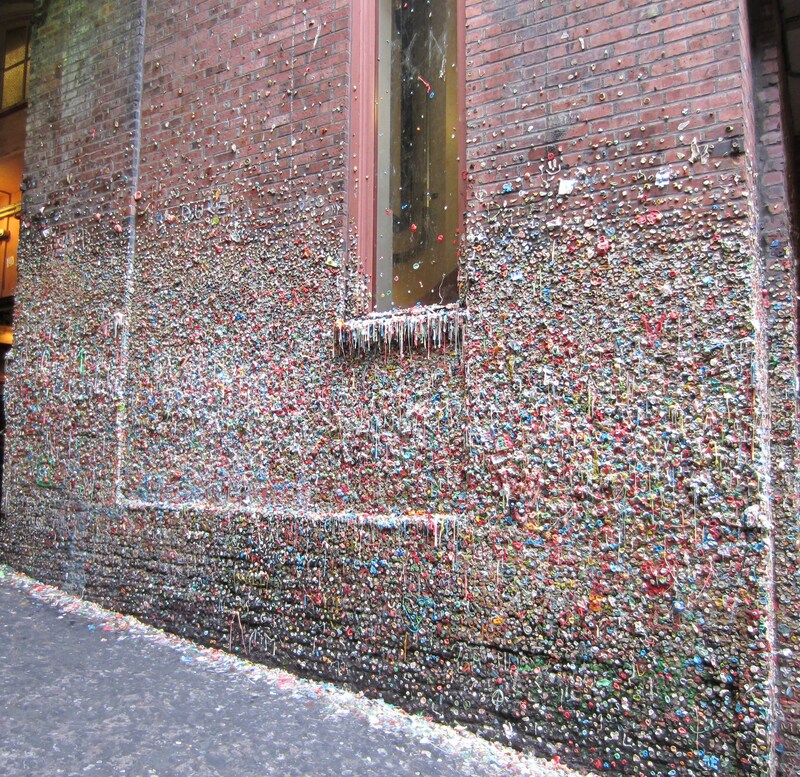 If you are going to be in Seattle late in the day, take the Market Ghost Tour (http://www.seattleghost.com/) Look for the Market Theater sign and meet your fellow ghost walkers at the Gum Wall — probably the most disgusting attraction I’ve ever seen. If you are so inclined, add your own contribution to the wall. The tour guide said this was the second most germ-ridden attraction in the world – second only to the blarney stone — think about it — all that kissing. 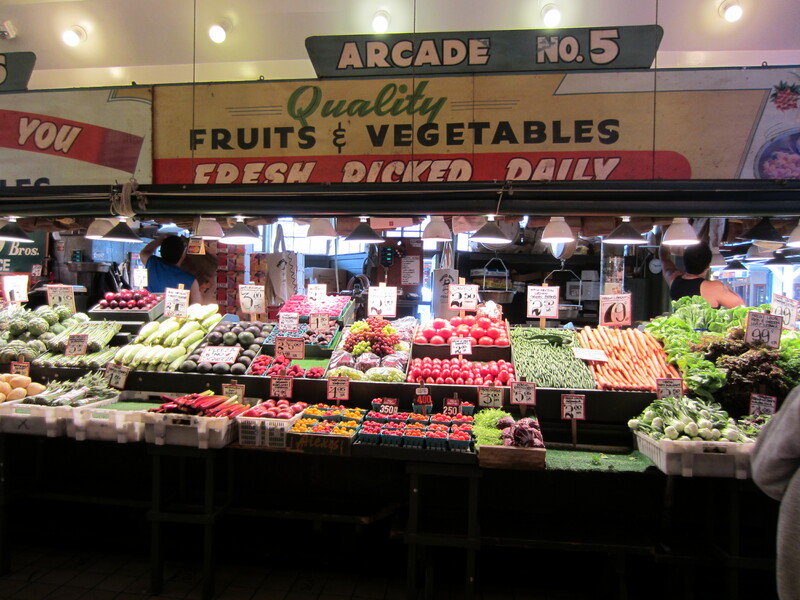 The tour guide led us through a walking tour of the behind-the-scenes areas of the market and surrounding buildings. At each stop, he told us a story of Seattle’s colorful past and the engaging market characters. 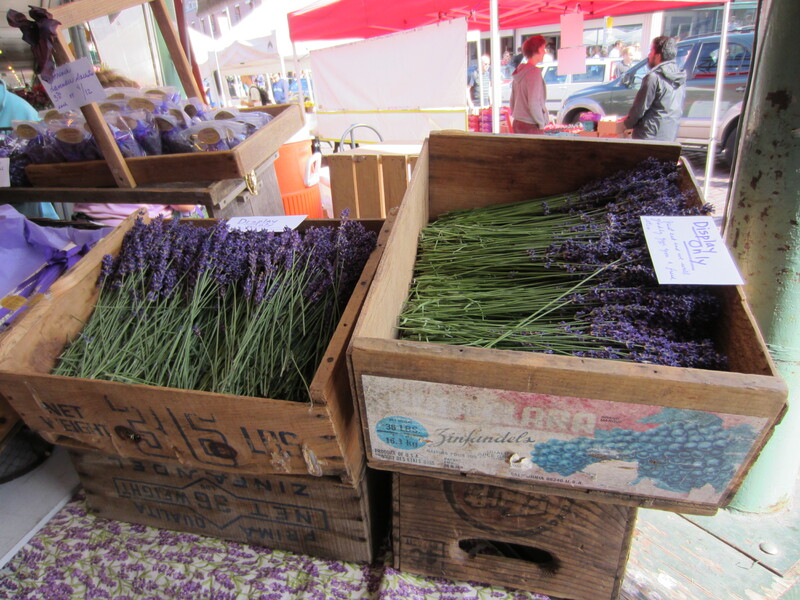 My favorite stories included the child with no eyes who liked to color at the Market pre-school; Princess Angelina, the Indian with the crystal blue eyes; and the story about the lavender plum tree blooming over the ashes of a famous Pike Place character. We enjoyed the ghostly stories and it’s a great way to spend a couple of hours. Unfortunately, we didn’t see a ghost but at dusk, as if on cue, we did see the sun rays breaking through the clouds. For the next leg of our journey we were heading to the Bainbridge ferry and onward to lavender farms of Sequim ending up in Port Angeles for the night, so we bought a couple of cute Pike Place Market 2011 signature bags and then added a bunch of those famous Washington Ranier cherries. We also stopped by the bakery for a selection of delicious fresh-baked cookies. 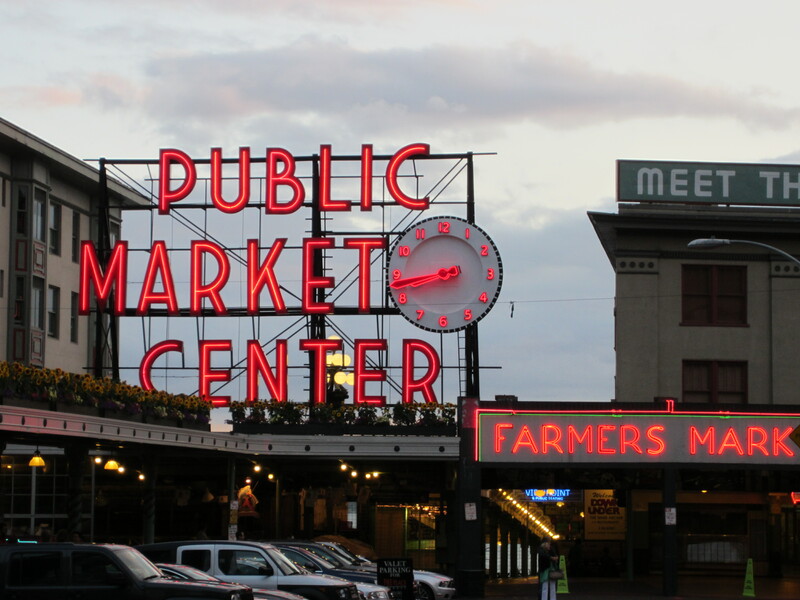 Our first evening in Seattle, we did the Market Ghost Tour and then returned the next morning for breakfast. 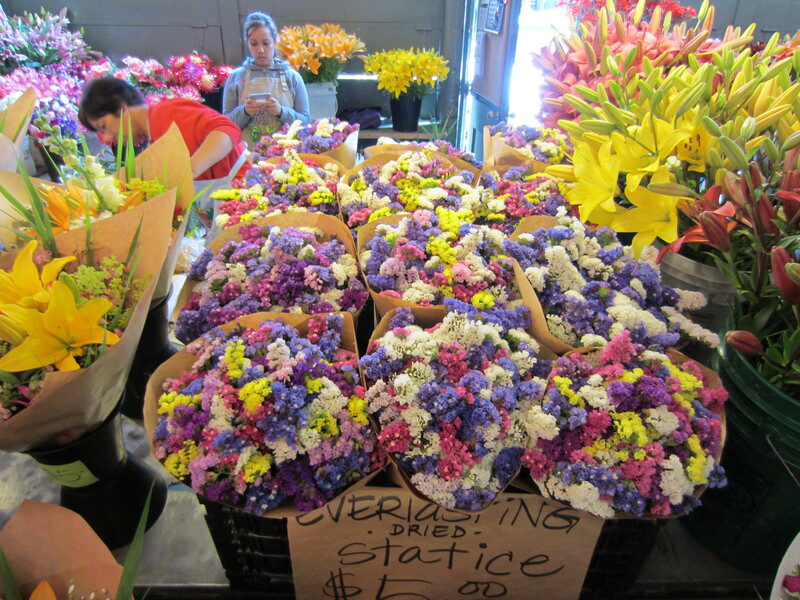 On a previous business trip, I walked around the market before the long day of meetings began. Early morning is a unique time at the market as the vendors prepare for the day. I saw cheese being made and cookie dough being mixed. It was enlightening. 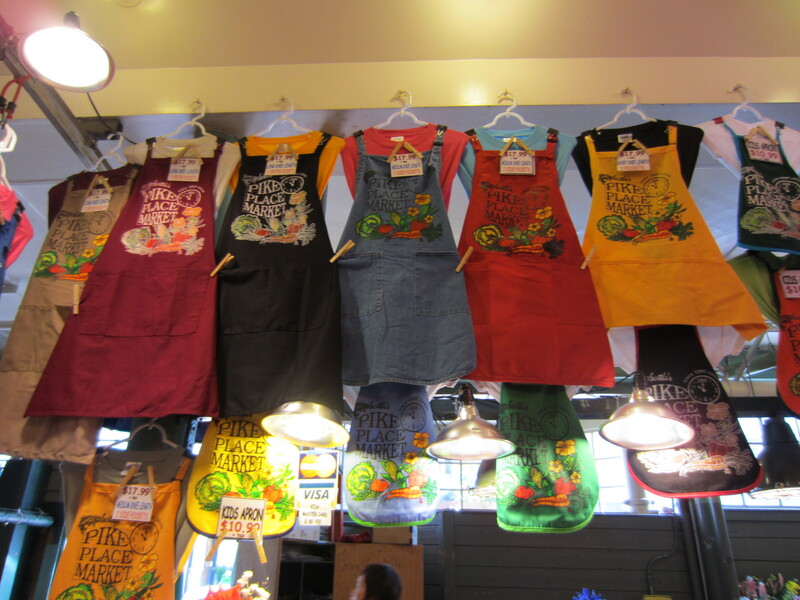 But really, anytime of day is a great time to visit the Pike Place Market. 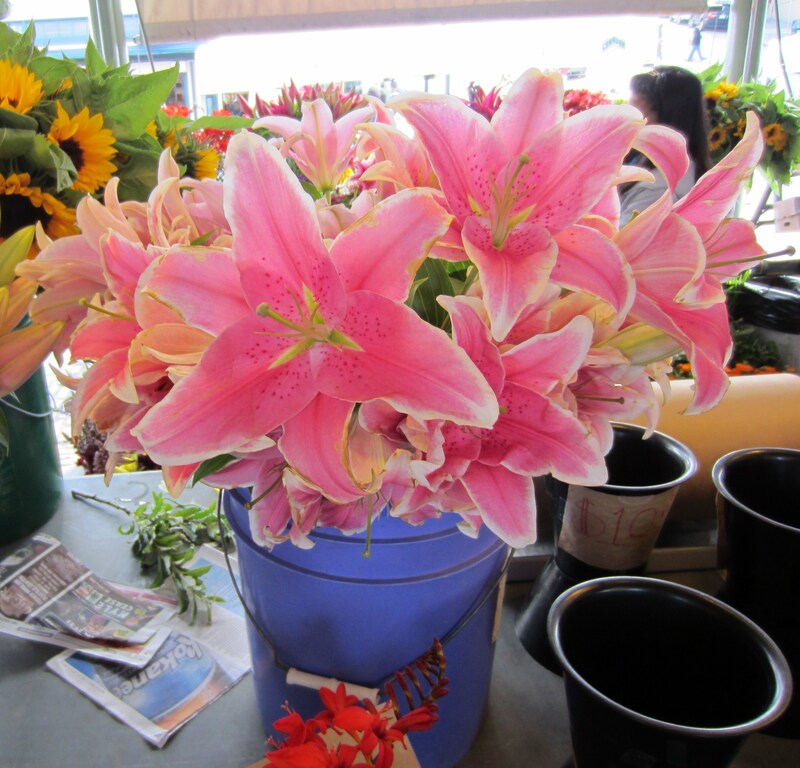 Here’s a few pictures from our evening and morning at the market. 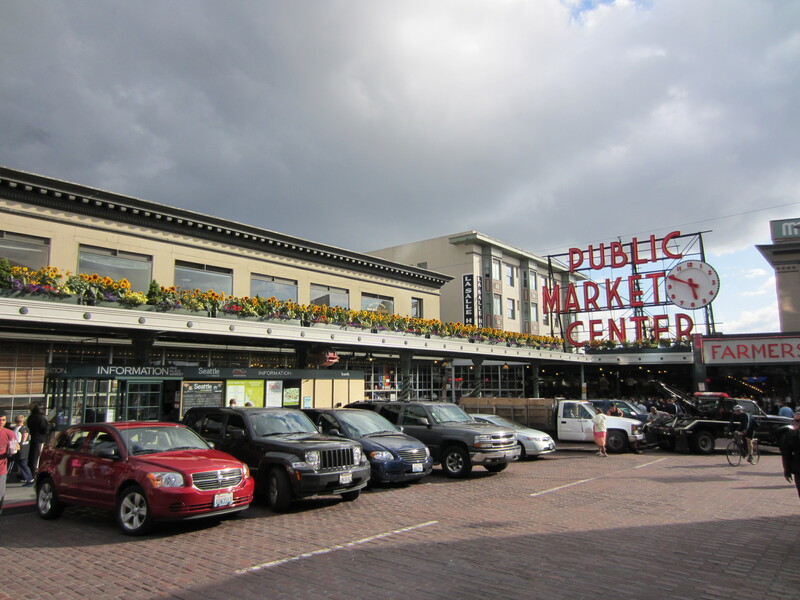 This entry was posted in Northwest USA and tagged Market Ghost Tour, Pike Place Market, Seattle. Bookmark the permalink.